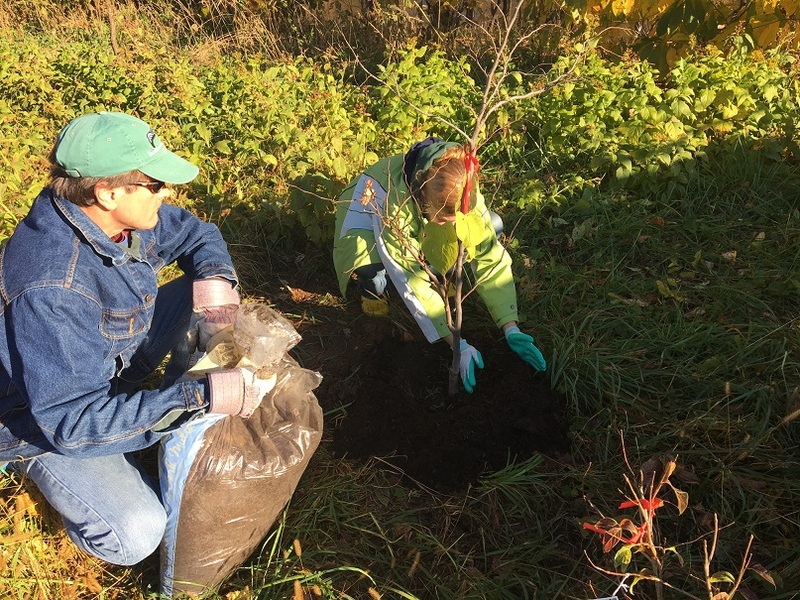 This Fall season, as part of our work as the “Community Support Organization” for Seven Bends State Park, Friends volunteers planted a selection of native trees and shrubs to spruce up a riverside access area and help get the Park ready for eventual public use. 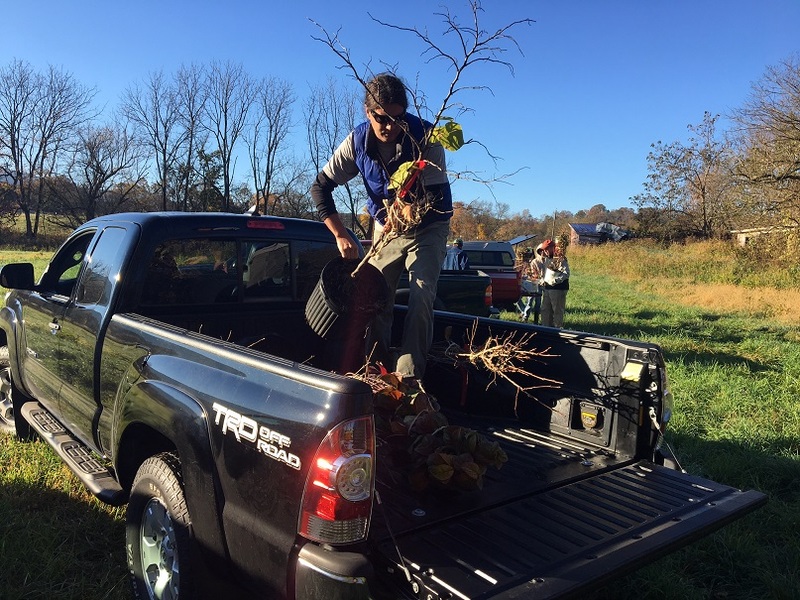 Supported by a Keep Virginia Beautiful grant, this project includes trees to help mark the trail entrance as well as shrubs and trees that add to the native diversity of the buffer area. In the spring we’ll fill in more with appropriate wildflowers. It’s going to be a beautiful spot for river fun and reflection. One of the goals of Friends of the North Fork is to see well-established forests along our streams and rivers. Forest buffers help to hold river banks together, preventing erosion. The trees and undergrowth also absorb nutrients running off fields and roads before they hit the stream. Trees provide shade, keeping water cooler, which means it holds more oxygen, leading to healthier fish. Trees along rivers are just a tremendous benefit for many, many reasons. 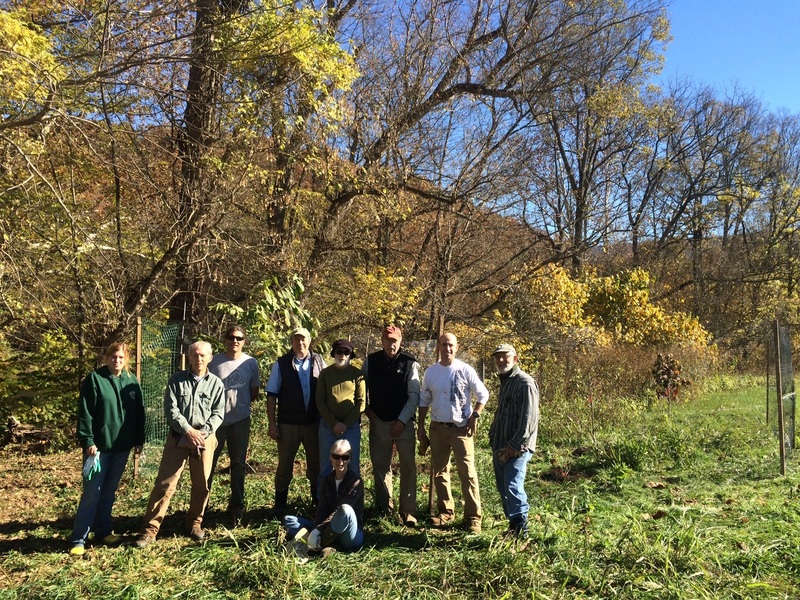 On Saturday, November 5th, 8 Friends of the North Fork volunteers led by Sari Carp of the Northern Shenandoah Valley Master Gardeners planted 19 native trees and bushes. Volunteers planted dogwoods, redbuds, fringe trees, button bushes, and spice bushes at the head of a trail leading to the river and along the bank of the river at Seven Bends State Park. Volunteers protected the new plantings with deer fencing. As part of the project, volunteers also removed yards of old wire fencing that were lodged in the ground, making the site safer for visitors. Friends will also add a dovetailed Catalpa bench by Woodstock artist Glenn Richardson, purchased through the grant, at the site and plans to work with another volunteer to propagate wildflowers, including Virginia bluebells and wild ginger. The spot provides ideal river access for Friends’ educational activities with local schools related to river health and the importance of a robust riparian buffer. Should the project expand with enough volunteer support, it will become an official Master Gardener project with educational materials on native and invasive species. “We’re very excited by the potential for Master Gardeners becoming more involved in designing plantings and developing education at the Park,” Carp said. Friends volunteers have signed up to maintain these plantings and the group plans to focus on invasive removal and plant inventory, in partnership with Master Naturalists in 2017.